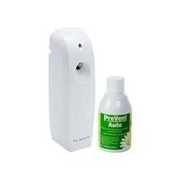 Cluster Fly Automatic Dispenser and Aerosol is a product combination that we would suggest for you to use once you have given a full pest control treatment to kill and get rid of cluster flies. After you have used an insecticidal liquid spray, powder and given a fumigation treatment with smoke bombs or smoke foggers, the Cluster Fly Automatic Dispenser and Aerosol can be set to give regulated bursts of insecticide that will continue to kill any cluster fly that may find its way into your loft, attic, roof space or garage. We supply either PREVENT or SWAK aerosol canisters with our Cluster Fly Automatic Dispenser, please see below for refills. Please note that we would always recommend a comprehensive cluster fly treatment with a range of products that we sell either in kit form or separately. Please see below. And for added, year round control of cluster flies, as well as using our Cluster Fly Automatic Dispenser and aerosol, you may consider using also or instead, an electric cluster fly killing machine. Please see below.